I had an upper denture made and a lower partial. Dr. Infantino is a perfectionist. Beautifully done . I highly recommend Dr. Nick. Fantastic staff. Great service, nice people, good work on my teeth. This was my first visit to Dr. Nick Infantino, and every aspect of the visit exceeded my expectations. I didn't have to wait, the staff and doctor all welcomed me to the office, and everything from the x-ray and cleaning to the exam went smoothly. I would highly recommend. Dr. Nick Infantino is a wonderful dentist with many years of experience. He is very thorough and takes the time to explain his findings . He is also very witty and has a great sense of humor which makes every visit fun. Everybody in the office is very nice, warm, and welcoming. If you are looking for a great dentist, I totally recommend Dr. Infantino. Dr. Nick is very approachable with a delightful sense of humor. The staff is very eelcoming, too! Dr. Infantino is a great dentist. I have seen several since moving to the Bay Area. He is professional and gives you an honest assessment of your dental needs and solutions. I have periodontal disease and need very good and close care. Dr. Nick has a comprehensive background in all aspects of dental treatment and I feel he goes "over and above" to save my teeth while doing it at a reasonable cost. Pam, my dental hygienist, does the very important job of cleaning my teeth on a quarterly basis. I believe I am getting the finest care from both of them. Dr. Infantino and team provide a top tier experience from the beautifully appointed office to the friendly and caring staff. They always make me feel appreciated and are sensitive to my individual needs. I refer all of my friends/colleagues to Dr. Infantino. Dr. Nick is absolutely the best Dentist on the Planet. He is skilled and artistic in his experience and caring attitude. His Staff is the best... I have been going here for 30 years and all my friends go there too... Check him out... you will be happy you did. Dr. Infantino is the best dentist I ever experienced. He took extra care to make surevI feel as little pain as possible which made me the surgery bareable. 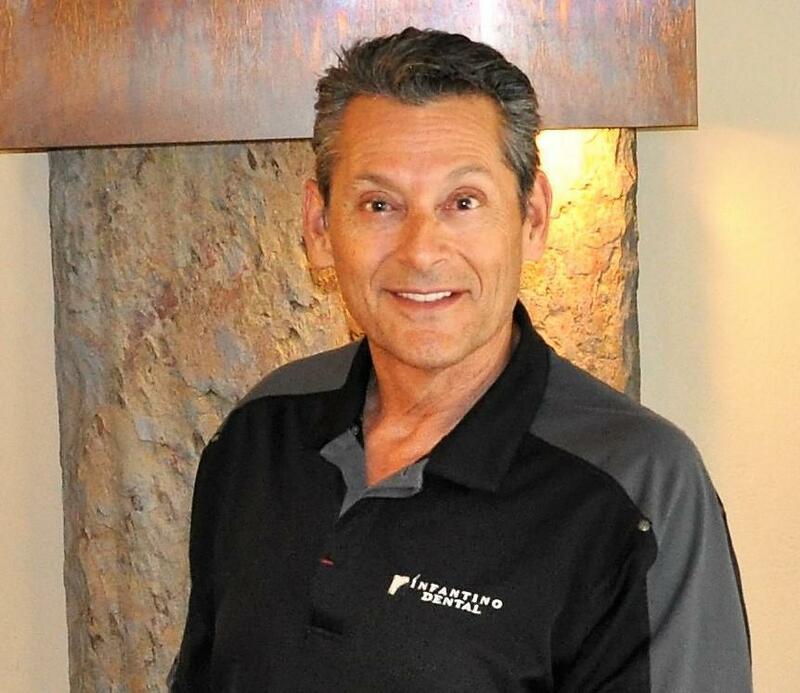 Dr. Infantino, his hygienists, and his entire staff are be Best in Silicon Valley. They do an excellent job in attending to you, and are always proactive in their care. Attending to your potential problems before they become more serious. I've been coming to Dr Infantino's office for awhile now. I love their friendly and professional staff. They always manage to put me at ease. My teeth feel and look great! Truly glad that I chose to go with Dr.Infantino. In addition to having a fantastic dentist, I find his staff and front desk to be a pleasure with their awesome attitude. They make the overall experience a very pleasant one, and consistently so. Our family has been going to Dr. Nick for a few years now, every visit is amazing. I never feel like I'm being sold a bunch of work I don't need, Dr. Nick is always very honest about the outcomes and then lets me decide how to proceed. This is also the first practice where I've actually experienced 100% pain free cavity work, and I've had a lot of cavities filling in my lifetime. Dr. Nick and his staff are top notch. 'Can't say enough good things. I've been going to Dr. Nick for 20 years. He's highly competent and has a self-confidence that's relaxing. Put simply, it's clear he knows what he's doing when he's working on you, never pausing or second-guessing himself. He empathizes with his patients, both physically and financially (let's be honest, finances can be a significant factor in making decisions). Frankly, Dr. Nick gets it. He is very articulate and will explain your condition and options in practical terms, giving practical advise (which can differ from by-the-book advice). On top of that, Dr. Nick has a great sense of humor and listens to his patients. It's no surprise he has patients that come in from across the country. Like a good lawyer, mechanic, financial advisor, etc., when you find a good dentist (or in this case an awesome dentist), you stick with them. Thanks for all the years of helping me keep my natural teeth, Dr. Nick! Dr. Infantino and his staff are top notch. There's a reason I travel all the way from Scotts Valley to his office. It's not convenient, but definitely worth it. Extremely friendly staff. They make you feel comfortable and right at home. Fast and efficient work with no pain. Scheduling fills up very quickly so make sure you book in advance and stay on top of your cleanings. Highly recommend them. So happy we found Dr. Infantino and his staff! Dr. Nick is at the top of his profession. His skill and attention to detail when working on my teeth is an A+. The staff is professional and always makes sure that I understand the billing, my next appointment etc. A highly recommend them. I have been a patient at Dr. Infantino's office for the past 16 years. I highly recommend him and his staff to anyone looking for a dentist. Excellent service, as always--personal feel, and new flooring and office looks great! It is not often that someone says they look forward to going to the dentist, but I truly enjoy going to Dr. Infantino's office. The staff is amazing and Dr. Infantino is always a pleasure. They are considerate of my needs and take a genuine interest in my concerns. I am very particular about the dentist I go to, and I have been nothing but impressed with Dr. Infantino's office. I'm with Dr. Nick for 22 years. He is the best! I have very bad anxiety with dentists and since moving to California I haven't been to the dentist out of fear. A few days ago I woke up with a tooth ache, but my health insurance just ran out. So I googled who accepts new patients without insurance and found this place, they got me in first thing in the morning (they even offered to get me in when I called but I had to go to work) the entire staff is extremely friendly from the girl Tiffany at the front desk, to the assistant Angel, to Sam the doctor! I highly recommend this place to anyone, it's a very clean, nice place that just makes you feel like you're in good hands, and I'm seriously the biggest baby when it comes to dentists!! I've been gong to Nick for 25 years, best dentist I've ever had. His staff is the best also including his new hygienists Teanne. Highly recommended especially for any cosmetic dentistry. Great Dental office! I generally do not like going to the dentist, but Dr. Nick Infantino was great. I had my teeth cleaned by a sweet and gentle hygienist and even though I was new to the office, everyone made me feel like I was a long time patient. Will definitely be coming back!!! I've been bringing my young daughter with me to the appointments, and I am so grateful to the staff for their warm and kind (and way beyond the call of duty) response to her presence. Peggy even takes her up front to play and draw. I am so appreciative and grateful for this special attention, and I don't take it for granted! Thank you! I have always been very happy with my cleaning with Joy and any dental work with Dr. Nick! The Infantino's run an awesome family owned dental practice here! Upon my first visit the staff was very kind and helpful. I've had my initial x-rays, teeth cleaning and cavities/fillings repaired thus far by Sam Infantino in this office and all my experiences have been much better than what I've experienced in the past. They have made sure I'm sufficiently numb for any procedures and the staff is very conscious of the patient's comfort throughout any visit. I would definitely suggest this office to anyone looking for dental work! I have been going to Infantino Dental for several years and found both Dr. Nick and Dr. Sam to be totally honest in their evaluations and to provide excellent dental work. I highly recommend Dr. Sam! He has done all of my dental work since 2010 and though I have to move to southern CA, I am seriously considering coming back here when I need any serious dental work done. The staff are always kind and friendly and this is the first dental office I enjoy visiting. Seriously, want excellent work with little to no pain? Go! I feel comfortable with Nick! I feel paranoid that Dentists just want my money. Hopefully, I will change my fears. Thank you Dr Sam for filling up my cavities. I am glad you did not continue to file my tooth as my bite felt just perfectly fine after the effect of the anesthesia wore off. Great service, everything was well explained. However pocket test results seemed inconsistent and filling was recommended when I'm not sure it is necessary. I visit Infantino Dental for cleanings every 6 months, but haven't had any other work done here. I was very anxious about having fillings done this morning and Doctors Nick and Sam Infantino immediately calmed me down. Not only were my injections painless, but so was the entire procedure. I would definitely recommend this location to friends and family! I finally saw Dr. Infantino and he took care of my pain ! He and his crew are such caring people ! He kept asking me if I was doing ok. He made this terrifying experience a little less scary. We laughed so much ! I'm sorry I tried another dentist ! Nick can NEVER retire !!! And to end the day, Dr. Infantino called me at home to check up on me and to make sure I am doing ok. I just love him !!! I recommend everyone ! You want the best, they are it !!! I've only had experience with Nick, but I hear Sam is fantastic as well [Like father, like son! ].I have always been terrified of the dentists, and for a good 10 years, stubbornly refused to go to them. After I received the recommendation, I gave in and came here. One of the questions on their initial questionnaire was, "How afraid of you are you of dentists?" (or something along the lines), which made me laugh. The staff is extraordinarily nice, and Dr. Infantino is beyond the most amazing dentist I've ever had [I'm still only slightly terrified of him...residual child-like fears, I suppose].He gets right to the point, and explains *everything* he's doing. I even go to see the pictures of my cavities, post drilling, then what it looked like with the filling. Most of the time, he'll talk and before I know it, the procedure is done! Not to mention he rides motorcycles and dirt bikes -- there's plenty to talk/listen to while you're there. I can't give enough praise and stars for Dr. Infantino's practice. I've been going here for about 2 years, and I can't imagine going anywhere else. Dr Nick and Dr Sam Infantino are wonderful! I have been a patient of Dr Sam for 2 years now.Dr Sam's knowledge and experience really set me at ease. I have to say, Im am somewhat of a dental phob. I was putting off getting my veneers replaced for years. Dr Sam and his assistant, Marina, made me feel comfortable. I popped my headphones in and before I knew it, I was saying "is that it, youre done?? "He has a very gentle touch and was sure to keep asking me how I was doing.I am SO HAPPY with my new veneers! I didnt even know they could look this nice and this natural. The lab that they use to make the veneers is really close by and the lab guy actually comes to look at you, your face, your smile, and your other teeth to match everything perfectly. I will never go anywhere else! I'm new to the south bay and didn't have a regular dentist, I found a listing for Dr Nick Insantino dds dental in Cupertino... It's a family run business (father and son) that makes you feel like you're part of their family. Overall my experience was as high as I could possibly rate. Dr Insantino will def be my regular dentist now. In short, great experience overall, super friendly, family owned by father and son (how cool is that? ), and you really feel like part of the family, even when you're only talking to them on the phone. I'm a fan! I've been a patient of Dr. Nick Infantino's for approximately 20 years. There were times where I moved away, and had other dental experiences. Long story short, I had to pay a lot of money for bad work elsewhere, then paid again to have Dr. Infantino remove and replace other dentists bad work (implant that gave me a lisp, crowns, etc). I am so happy to be living back in the bay area, but I know if I move away again, I will plan my dental work around my bay area visits! It's cheaper to do it right with Infantino the first time! My dad needed to go in for an emergency type surgery to get his wisdom tooth removed, because it was really bugging him. I called 1800 Dentist and they found these guys, because they accepted emergency situations.When I called, the receptionist was super nice and gave him an appointment for 1:00pm considering we were going from Santa Clara (I called at 12:00pm). When we got there, we had to wait for like half an hour, because it was really busy, but that was fine, because they were taking him on such a short notice. They took an x-ray and explained the problem. Christina, who took the x-ray, was extremely nice and friendly. I had to wait outside and then Dr. Sam told me what they were going to do and about how long it would take.At the end of the surgery, Angel, called me in and explained the post-surgery diet and everything. I had a great experience with them and the staff was super friendly. Thank you soo much for the great service. I loved the dental hygenist there. I'm a big chicken when it comes to the dentist but she was really great and knew when to take it easy and give my mouth a break. One of the best things about the office is that the wait was nothing and it was really easy to schedule an appointment.I have to go back to have a cavity filled next week. I'm really nervous but hopefully it'll all be ok! Who knew going to the dentist would be...pleasant? At Dr. Infantino and Dr. Sepi's office, I really don't mind coming in.WHO:My personal dentist at the practice is Dr. Sepi Mostesheri, a friendly, professional, caring, not to mention beautiful, woman. (I'm not sure if I'm spelling Mostesheri correctly). PERSONALITY:I hate shots and have a gagging reflex, not to mention have a small mouth. However, having Dr. Sepi work on my teeth, listening to her give me recommendations for my upcoming Spain trip, asking me about my family, puts the entire experience at ease. She always greets me with a smile making me feel like we are old friends. On an unprofessional note, she has beautiful eyes which I don't mind staring into while she hovers over me.HONEST WORK:I was recommended to this practice around 5 years ago. For years and years, I was told that I had no cavities, but should floss. Hearing that I had no cavities so often was a refreshing change to hearing dentists tell me I had to get something fixed (hence pay) every visit.Once, while I visited my dentist cousin, he filled a cavity for me. When Dr. Sepi saw this, she said she did not remember putting that filling in (what a memory!). When I told here it was the works of my cousin, she complimented it. FIXING A BAD SITUATION:Last year, Dr. Sepi identified 2 cracks in my tooth so I had to get a crown. There was one part of the process that was particularly unbearable where she had to push a bitter tasting thread into my gumline. She could tell I hated it so she made sure to take it out as soon as she could. When I came back to change my temporary crown to my permanent crown, she was not happy with the shade it was in as it did not match the rest of my teeth. She called the lab immediately and expressed her disappointment and demanded (politely) he fix the color right then and there. This was great because I would have had no idea how to match the tooth nor would I have imagined it could be done with just a short wait without a need to come back for another appointment.Dr. Sepi goes above and beyond and is simply a sweet woman. Honesty is something somewhat difficult to find in dentists but she is a dentist I truly trust with my dental health.